Welcome to the Diabetes Meeting 2019! With the amalgamation of peerless speakers of Diabetes 2018 Conference Series is privileged to announce its “30th Diabetes Conference” which will be held during October 21-22, 2019 at Zurich, Switzerland. We cordially welcome all the eminent researchers, students and delegates to take part in this upcoming Diabetes conference to witness invaluable scientific discussions and contribute to future innovations in the field of Diabetes. According to WHO, about 60 million people with diabetes in the European Region. About 10.3% of men and 9.6% of women aged 25 years and over. Worldwide, high blood glucose kills about 3.4 million people annually amongst 80% of these deaths occur in low- and middle-income countries, and almost half are people aged under 70 years. WHO projects diabetes deaths will double between 2005 and 2030. 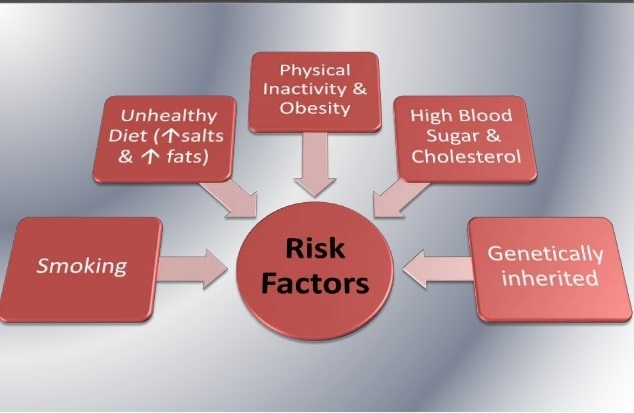 The overall risk of death among people with diabetes is at least double the risk of their peers without diabetes. Reflecting this imperative, Conference Series is all set to host Diabetes conference in Berlin, Germany this year which will provide the future leadership in this key area for global health. 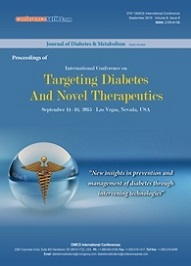 Diabetes Meeting 2019 will focus on the latest and exciting innovations in all areas of Diabetes research which offers a unique opportunity for investigators across the globe to meet, network, and perceive new scientific innovations. This year’s annual congress highlights the theme, “New Therapeutic Mechanisms of Diabetes” which reflects the innovative progress in Diabetes research. The two days conference includes workshops, symposiums, special keynote sessions conducted by eminent and renowned speakers who excel in the field of Diabetes which include: Advanced Technologies for Treatment of Diabetes, Emerging Focus in Diabetes Research, Diabetes Research in Clinical Practice, Computational Biology of Diabetes, Cell Therapy for Diabetes and its Complications, Genetics of Diabetes, Diabetes Management, Transplantation for Diabetes, Endocrinology Disorders and Treatment. Zurich is a leading global city and among the world’s largest financial centers despite having a relatively low population. The city is home to a large number of financial institutions and banking giants. Most of Switzerland’s research and development centers are concentrated in Zurich and the low tax rates attract overseas companies to set up their headquarters there. Many museums and art galleries can be found in the city, including the Swiss National Museum and the Kunsthaus. According to several surveys from 2006 to 2008, Zurich was named the city with the best quality of life in the world as well as the wealthiest city in Europe. The Economist Intelligence Unit’s Global Liveability Ranking sees Zurich ranks among the top ten most liveable cities in the world. Zurich has, depending on the definition used, an oceanic climate (Koppen Cfb), with four distinct seasons. Decisive for the climate of Zurich are both the winds from westerly directions, which often result in precipitation and, on the other hand, the Bise (east or north-east wind), which is usually associated with high-pressure situations, but cooler weather phases with temperatures lower than the average. The Foehn wind, which plays an important role in the northern alpine valleys also, has some impact on Zurich. The city of Zurich is among the world leaders in protecting the climate by following a manifold approach. Public transport is extremely popular in Zurich, and its inhabitants use public transport in large numbers. Zurich city highlights are The nation’s biggest lakes—Geneva, Constance (Bodensee), and Maggiore— straddle the French, German-Austrian, and Italian outskirts, individually. The Rhine, safe from Basel toward the North Sea, is the key inland waterway, National Museum Zurich, Platzspitz – a Historic Park at the Heart of Zurich, Hans Waldmann – a Military Leader and Mayor of Zurich in the Late Middle Ages. About 70% of the visitors to the city use the tram or bus, and about half of the journeys within the municipality take place on public transport. Within Zurich and throughout the canton of Zurich, the ZVV network of public transport has traffic density ratings among the highest worldwide. The concept of 'new technologies' for type 1 diabetes and new discovery and advanced type 2 diabetes treatment has expanded in recent years at a rate that some might consider comparable to 'Moore’s Law', and the sheer number of new technologies entering into the type 1 diabetes marketplace is also growing at a remarkable rate. From the patient’s perspective, this is not only exciting but can lead to a sense of optimism. Technologies that today are growing commonplace (e.g. insulin pumps, rapid HbA1c monitoring, etc come under new therapeutic mechanisms of diabetes. Indeed, it could be argued that the major advances in type 1 diabetes care made within the last quarter of a century have come from technology rather than biology. At the same time, not all new technologies succeed (e.g. the Glucowatch), regardless of their purported promise. Both type 1 diabetes patients and their healthcare providers will soon see a series of further advanced medical technologies used in hospital and new technologies and novel therapies in diabetes treatment whosbasis is tied to the notion of improving the lives of those with the disease. Getting a new heart, liver, kidney, lung, or other organ can save your life. Sometimes, it can also lead to type 2 diabetes. 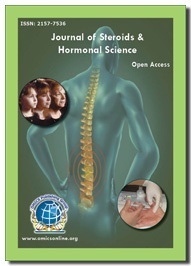 Many people can stop taking steroids after 6 months or so. This may solve the problem. If scientists can develop safe immunosuppressant’s that always work, then many people with type 1 diabetes may choose to have pancreas transplants. Until then, many doctors think islet transplants are a better option even after performing clinical trials on islet transplants. Islets are clusters of cells in the pancreas that make insulin. In people with type 1 diabetes, islet cells are destroyed. Only 1-2% of the pancreas is made up of islet cells. In pancreatic islet transplantation, cells are taken from a donor pancreas and transferred into another person. Once implanted, the new islets begin to make and release insulin. Researchers hope that islet transplantation will help people with type 1 diabetes live without daily injections of insulin. 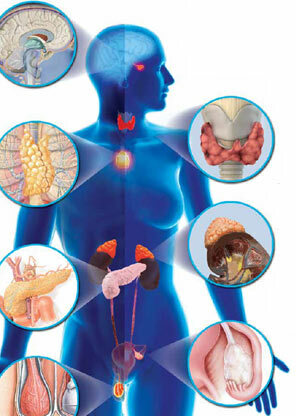 A transplant of the pancreas is usually reserved for those with serious complications. Pancreas transplants are most often done when a patient also receives a new kidney. 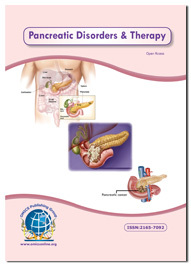 The pancreas transplant adds little further risk in this situation and offers big benefits. However, transplant surgery is risky. Each person needs to carefully weigh the potential benefits and risks. Xenotransplantation for the treatment of type 1 diabetes is the transplantation of living cells, tissues or organs from one species to another. Such cells, tissues or organs are called xenografts or xenotransplants. A bolus dose is insulin that is specifically taken at meal times to keep blood glucose levels under control following a meal. Bolus insulin needs to act quickly and so short acting insulin or rapid acting insulin will be used where as Conventional insulin therapy is a therapeutic regimen for treatment of diabetes mellitus which contrasts with the newer intensive insulin therapy. Computational meta-analysis can link environmental chemicals to genes and proteins involved in human diseases, thereby elucidating possible aetiologies. The recent rapid development of a variety of analytical platforms based on mass spectrometry and nuclear magnetic resonance have enabled identification of complex metabolic Syndrome phenotypes. 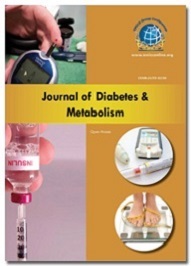 Continued development of bioinformatics and analytical strategies has facilitated the discovery of causal links in understanding the pathophysiology of diabetes and its complications. 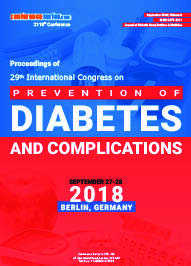 Conference Series successfully hosted its premier 29th International Congress on Prevention of Diabetes and Complications during September 27-28, 2018 at Berlin, Germany. Diabetes Meeting 2018 marked with the attendance of Organizing Committee Members, Scientists, Doctors, Diabetologists, Nurses, community care specialists, young and brilliant researchers, business delegates and talented student communities representing more than 20 countries, who made this conference fruitful and productive. Conference Series has taken the privilege of felicitating Diabetes Meeting 2018 Organizing Committee Members and Keynote Speakers who supported for the success of this event. Last but not the least Conference Series wishes to acknowledge with its deep sincere gratitude to all the supporters from the Editorial Board Members of our Open Access Journals, Keynote speakers, Honourable guests, Valuable speakers, students, delegates and special thanks to the Media partners for their promotion to make this event a huge success. 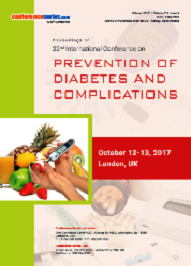 With the enormous feedback from the participants and supporters of 29th International Congress on Prevention of Diabetes and Complications, Conference Series is glad to announce its 30th International Congress on Prevention of Diabetes and Complications held during October 21-22, 2019 at Zurich, Switzerland.